Online applications are invited by Chhattisgarh Revenue Department Recruitment 2019. Interested candidates for Chhattisgarh Revenue Department Recruitment 2019 of 250 Patwari vacancies. Candidates Can Apply Through the Official Website www.cgvyapam.choice.gov.in Both Male and Female Can Apply Online For Chhattisgarh Revenue Department Recruitment 2019. The Selected candidates get pay Rs. 38,100/- Per Month. 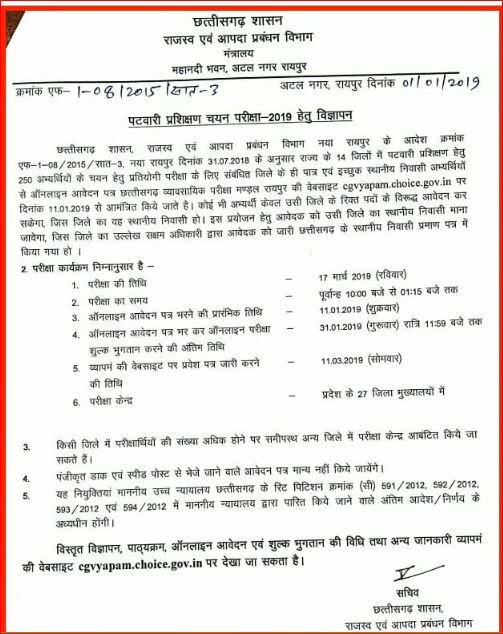 Chhattisgarh Professional Examination Board, Vyapam Bhavan, North Block, Sector- 19, Naya Raipur, Chhattisgarh 492001.